is our only guide to faith and practice. By it, we understand who God is and what He wants us to do. In our worship service, we dedicate ourselves to hearing The Word of God spoken, explained and taught from the pulpit by our Pastor. We hold the Bible in the highest position - higher than any book that a mere man can write, and we worship God during our services by being taught His Word. If you love God's Word, you'll love our church. 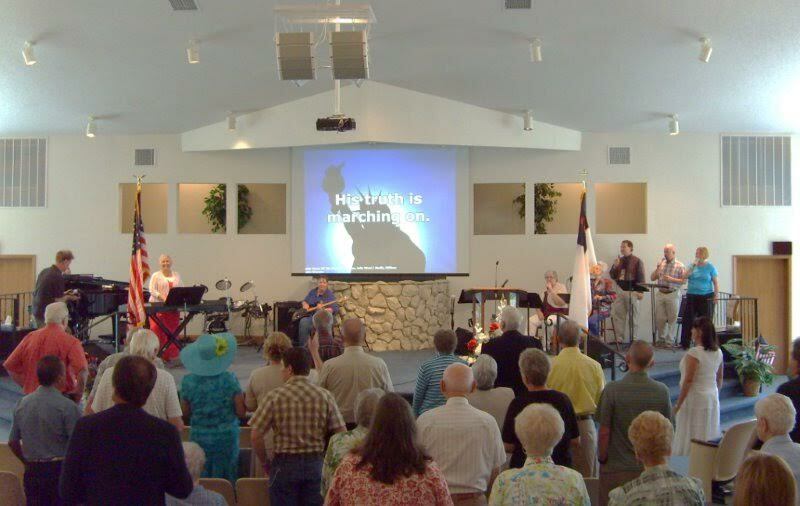 psalms, hymns, and spiritual songs leads us into the presence of worship. We love upbeat, contemporary music, yet we always keep the old hymns as part of our blended music porfolio. Music surrounds our worship service. Your heart will be warmed by our worship music - from the introduction to the closing hymns of praise. is celebrated every Sunday, following the Lord's command to have this memorial service. It is an intimate time when we bring to mind the price that He paid for us. If you have named Christ as your Savior, we invite you to worship Him with us in Communion. Our practice is to distribute the bread and cup to all and then allow each individual to partake when they have set their heart right with God. is so much more than an obligation. It is an opportunity - one in which we have the privilege of participating in the work that the Lord is doing in His church, both here and in all corners of our world. Giving is Worship!